CHEAP RATES + NEXT DAY DELIVERY! When giving your garden a trim, you might be tempted to toss all your waste in one bin. After all, it’s all green waste, right? Even though green waste consists of organic materials, not all of it will degrade in time. Green waste should be biodegradable, like food waste, grass/flower cuttings, and fallen leaves, but placing the wrong waste in the wrong place can cause problems. The unlawful dumping of garden waste in nature reserves increases the threat of fire and dumping organic materials in water drainage systems like a kitchen sink can cause a blockage. Fortunately, there are more responsible ways to get rid of green waste – provided you’re clear and what you can and can’t dispose of. The green lidded bins you’re provided with are strictly for the following green items. Here’s a hint – if it’s going to start smelling bad as time passes, chuck it in. Here are items that shouldn’t be placed in green waste bins. You’ll see that many of them are organic – just not biodegradable in a short amount of time. Place the bin in a shady spot. To prevent your bin from smelling, layer fruit and vegetable scraps between green waste such as grass cuttings and leaves. Once emptied, hose your bin. Use Council-approved compostable liners to collect all your kitchen waste before putting it in the green bin. 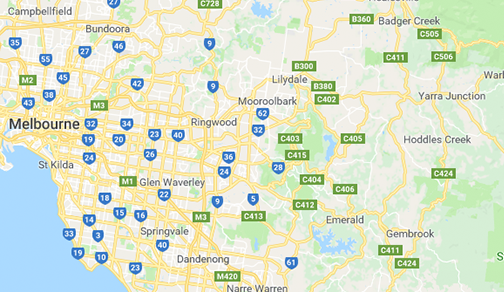 If you sort your green waste correctly, it can be used to make nutrient-rich compost for local agriculture and backyard gardens, while at the same time reducing harmful methane gas emissions at landfill sites. If you don’t as yet have a green waste removal service or have more green waste than what your bin can handle, contact us today. We have used WM waste 5 times this year for mixed house hold waste. They are very reasonably priced - always on time and it is quick and easy to book. I'd recommend to anyone. Amazing customer service! Fast and efficient! I would highly recommend them. Thank you so much. Used them a couple of times now, competitive rates, reliable and helpful staff. 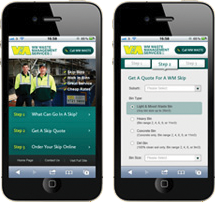 You can get an instant quote and order your skip from your mobile phone. Maybe we can even deliver today! Get rid of the waste from your home or job site. Book your bin today! Ready To Order A Bin?